Become Jason Bourne as he tries to outrun government assassins and discover the secrets of his past. Based on Robert Ludlum's series of Bourne books, the Bourne Conspiracy was developed by High Moon Studios. It follows and expands on the story of the movies, and attempts to mirror the shaky-cam look they possessed, but it does not feature Matt Damon as Jason Bourne. It was released on June 3, 2008. Following the story of the movie, the game starts the player as Jason Bourne, on a mission to assassinate Nykwana Wombosi, a former African dictator. As Bourne approaches him, he realizes he can't kill him because Wombosi's children are present. Jason attempts to escape the boat but is shot in the back and falls into the ocean. He is found by a fishing trawler some time later, and finds out that he has amnesia but that he is somehow able to perform uncommon tasks such as speaking several languages and being very skilled and hand-to-hand combat. Bourne finds a small laser pointer that points him to the bank of Zurich, but when he shows up, the bank guards try to arrest him. It seems that the US government is now hunting him. Now Bourne must avoid the global drag net, while trying to piece together his past and the reason he is being hunted. 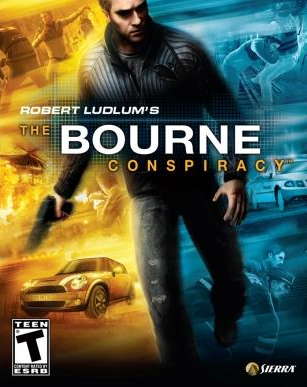 The game essentially follows The Bourne Identity film, but also changes things up by adding sequences that were not present during the movie. These scenes all involve Bourne while he was still a fully functional thirty-million dollar weapon, in the employ of the secret government agency known as Treadstone. These sequences are activated whenever Bourne finds some item that jogs his memory such as a passport or a newspaper. This level shows Bourne running through Marseille, trying to neutralize one of Wombosi's men, a bomber. Bourne tries to board Wombosi's boat, and must fight a helicopter and Wombosi's personal bodyguard. In this flashback mission, Bourne must eliminate a prisoner named Divandelen, who's being transported by Swiss officers to the airport so he can be extracted from the country. However, Divandelen's terrorist group sets him free and Bourne chases after him through an airport, a subway, a runway and finally kills him in a flying plane. Bourne must assassinate a Russian terrorist which he does by shooting him in the face than escaping the university he was hiding in. The gameplay features hand-to-hand combat and weaponized objects styled after the action sequences in the films, and gun battles with government agents and commandos. There is also a vehicular sequence where you are driving through the streets of Paris while evading law enforcement. During close combat an adrenaline meter fills up as the player successfully lands hits, once the meter fills he can perform a special attack that features Bourne delivering a violent set of blows to his opponent, often contextual to the immediate environment around them. There are three levels of adrenaline attacks: the higher the meter, the more opponents you can take down. At the third level, Bourne can dispatch three enemies one after the other, or if you are surrounded you can take them out all at once with a series of timed button presses. Additionally, there is a feature called Bourne Instinct, which can be activated by pressing the Y or Triangle button. This shows the player where enemies are on the map, as well as aspects of the environment that can be interacted with.